Why not... but I prefer my Excel file for now! And to answer your question, perhaps it's linked... I mean he pays $250$ a year because the ring means a lot to him, it's the symbol of their love... (= it's sentimental). But perhaps I'm wrong and people have different priorities! Thanks for sharing! Great to know. Happy weekend! @ Atulya: I get that the ring means a lot to him, but if it's lost or stolen no amount of insurance money is going to replace the sentimentality of the ring. @ Sunshinemeg and everyone else: Happy Weekend to you too! Um, wow, $400 (or even $250!) a year on jewelry insurance? No, that doesn't seem like an expense I would want, even if I had the income for it. Speaking of rings -- Sara, have you ever done a post on people deciding to not have wedding rings? My boyfriend and I were talking about it, and realized that I have a strong attachment to the symbolism of a ring, while he doesn't really see the need for spouses to wear them every day. I thought it was an interesting subject. Ophelie: practicality calls for a lack of rings, too. i work around a lot of guys who don't wear rings because a)they hate stuff on their hands b)it could fall into the water, and therefore, into oblivion and c)they could smash their hands and the ring could have to get cut off. so, i think it is an interesting subject for a lot of reasons. i've also seen guys get small tattoos of their wives names on their ring fingers, instead. Wow, insuring our rings never crossed my mind. I suppose that if you buy jewelry as an investment then it makes sense - I mean, what happens if you lose a $20,000 ring? I really couldn't sleep at night with that responsibility though. It makes me happy to know that the sentimental value of my ring outweighs its financial value. But if it was lost, it wouldn't break the bank to get a new one. meag, i totally agree! i look at expensive rings and think someone would mug me for it! i'm in love with my ring because it belonged to my FML and because my fiance put in a lot of research and effort to find me a diamond that was "me." since this is so contrary to his normal go-with-the-flow attitude, it makes my ring (and the thought behind it) even more endearing. I could be wrong, but I think smartypig has some restrictions on whithdawl until you hit goal (though they've been revised in response to user demand). I'd check into it before budgeting for a wedding, which has expenses come up throughout the process. HOWEVER, I've thought it would be an EXCELLENT option for a honeymoon registry without any fees, because it lets other people contribute to YOUR saving goals. 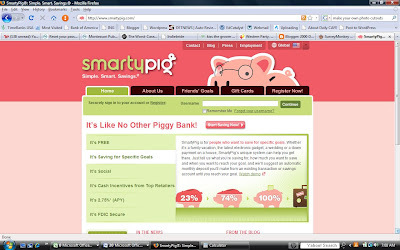 I currently use SmartyPig for savings. It does have some restrictions on withdrawal. You must close out the savings goal to withdrawal any money from that goal. This can be a pain, but if you setup multiple goals it would be fine. I currently use it for emergency fund, travel fund, home improvement fund, new furniture fund... A deposit is made each month (pulled from my main checking account). You can alter your goal at any time to increase or decrease contributions. You can also skip contributions for a month or add extra to any goal. The interest rate is much higher than other Online savings accounts. I highly recommend it. The idea that there is even a need for insurance for wedding rings because their replacement cost is so high, is a main reason I do not want a ring that exceeds $200 on my finger. Although I'm not engaged yet I did decide to have a conversation with my partner about this fact, as I worried when the day comes for him to purchase a ring he would be the type to spend alot because he thinks that is what is expected. I do not want to wear something that costs so much that I'm daily worried about loosing it. Cool website :) I also think it quite absurd to insure wedding rings--really? Why have them that expensive in the first place when you might damage it as you (should) wear it everyday? Um, yeah. I am pooped from a kickbox class at Urban Jungle. Recommend any good yoga places, Sarah? Absolutely not. I wouldn't do that, but we also shouldn't look down on him for that either. @ Sara, yes I agree! Saleswoman : what are you looking for? But he didn't mean he didn't love her, he thought that a ring is just a ring/thing. I love websites that promote smart finances like this! Of course I would be heartbroken if I lost my ring, but I think my fiance would be even more heartbroken to know I lost it after he spend his hard earned money on it. I know that it might be a little too "old school" for some here, but I know my fiance loves to see the engagement ring on my finger and know that he could give that to me. Over the lifetime we'll spend together, it is really just a drop int he bucket, but one that means a lot to me, and to him, and that makes it worth every penny. To us, insureing it at least means that in the off chance something happens, at least I can replace the centimental piece with something that looks similar and have a funny story to tell instead of a totally depressing one. Some readers here may not want to have expensive ring, but for people who do want to spend a little more for it, it would be stupid to carry a few thousand dollars around on their hand and not ensure it. You wouldn't not ensure your car, your home or other expensive purchases would you?